Leading Manufacturer of hdpe double wall corrugated pipes, dwc duct and pe corrugated pipe from Sonipat. 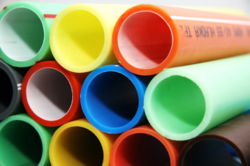 Our organization has successfully expanded its business in the market owing to the offered elevated quality array of HDPE Double Wall Corrugated Pipes that are chemically inert & environmentally safe. This corrugated pipe is used as underground cable protection and management for signal and telecom, power & optical fiber cable. 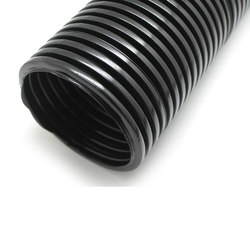 Our corrugated pipe is manufactured using virgin HDPE. This pipe is used as a cable protection ducts, drain and sewer applications. 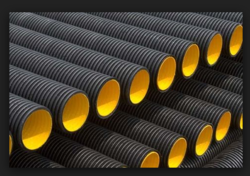 We at Gamson India, With sincere intentions to preserve and uplift our reputation in the market, we are offering a comprehensive range of DWC Duct also known as PVC Corrugated Pipes that is used as cable protection ducts; the offered pipe is available in several sizes. With the use of modern and sophisticated tools and technology, we are able to offer PE Corrugated Pipe . These PE Corrugated Pipes offered by as are highly appreciated for the great strength and incredible quality. Besides, these PE Corrugated Pipes are highly resistant to rust.